Kraft Field in Medford, Mass. MEDFORD – Kraft Field on the campus of Tufts University in Medford will again be the site of an NCAA Women's Soccer Tournament match. The Jumbos (12-3-1), New England Small College Athletic Conference (NESCAC) champions, will host Nichols College (13-7), champions of the Commonwealth Coast Conference, in a first round NCAA game on Wednesday, November 13, at 1:00 pm. Tickets to the game will be $4 for adults, $2 for students with ID and $1 for children and senior citizens. The winner will move on to face Keene State College (19-2-1) at the NCAA New England regional tournament on Saturday (Nov. 16) at Wheaton College in Norton at 1:30 pm. Bridgewater State College (13-5) is hosting Western New England College (15-6) in the other New England first round match on Wednesday. That winner will play host Wheaton (20-1) at the regionals on Saturday at 11:00 am. The New England region championship match is on Sunday at 1:00 pm. Tufts is making its third NCAA appearance in the last five years. In 2000, the university hosted five NCAA games, including the "final four." The Jumbos won an NCAA quarterfinal game against William Smith, 1-0, and a national semi-final against Wisconsin-Stevens Point, 1-0 in overtime, before losing to College of New Jersey, 2-1, in the championship match that season on Kraft. 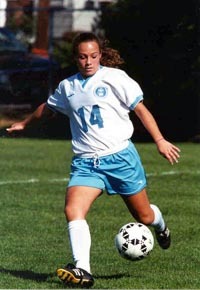 Tufts hosted four NCAA Tournament games in 1998, including a national quarterfinal. They won the NCAA New England regional championship on their home pitch that year. This past weekend (Nov. 9-10), the Tufts team hosted and won the NESCAC championship. The team earned the top seed after finishing first for the regular season. Head Coach Martha Whiting's team had entered its final match of the regular season versus Colby on November 2 in a four-way tie for first place in NESCAC with Amherst, Bowdoin and Williams. All four had 5-2-1 conference records. Amherst was eliminated from contention for the #1 seed with a 1-1 tie at Trinity. With Tufts, Bowdoin and Williams all winning their matches to improve to 6-2-1 in NESCAC, a series of tie-breakers was enacted to determine #1. In the end, it was Tufts earning its first regular-season crown. In the tournament semi-finals, the Jumbos eliminated Connecticut College, 2-1, on a penalty kick early in the second overtime by sophomore Jen Baldwin (Medway, MA/Medway). After Williams advanced past Bowdoin on penalty kicks, the Jumbos scored three goals in the first 40 minutes against the Ephs and went on to win the NESCAC title, 3-0. Baldwin had another penalty kick goal against Williams and scored three overall on the weekend. Perhaps some even-year magic is working for the Jumbos. As mentioned above, the team's two previous trips to the NCAAs were in 2000 and 1998. More likely, this is a Tufts team that has hit its stride since losing two of their first four games. Over the last 12 games, Tufts is 10-1-1 with a 25-10 scoring margin over its opponents. The Jumbos were the only NESCAC team to earn an NCAA Tournament berth. The conference has featured two straight national finalists, with Tufts reaching the NCAA final in 2000 and Amherst advancing there last season. Baldwin leads the Jumbos in scoring with eight goals and four assists for 20 points. Junior Jess Trombly (Nashua, NH/Bishop Guertin) has six goals and two assists for 14 points. Seniors EA Tooley (Syracuse, NY/Christian Brothers), Alle Sharlip (Kentfield, CA/Branson School), Cara Glassanos (Hingham, MA/Hingham) and Brenna O'Rourke (Bethesda, MD/Walt Whitman) were all on the 2000 NCAA Tufts team. Juniors Trombly, Becca Doigan (West Bloomfield, MI/West Bloomfield) and Jess Lovitz (Fairfield, ME/Laurence) were also key members of that squad. Junior Abby Herzberg (Sebastopol, CA/Analy) has emerged as a starter in every game this season. With only the four seniors this fall, the Jumbos are a young team. Sophomores Sarah Gelb (Hermosa Beach, CA/Mira Costa) and Catherine Benedict (Millburn, NJ/Millburn) are starters, while classmates Becky Greenstein (Newton, MA/Newton South) are Lindsey Wolejko (East Lyme, CT/East Lyme) are regulars off the bench. Sophomore Alina Schmidt (Harvard, MA/Bromfield School) has battled injuries this year, but is a starter when healthy. First-year players Sarah Callaghan (Northborough, MA/Algonquin), Lindsay Garmirian (Amherst, MA/Amherst) and Ariel Samuelson (Newton, MA/Newton North) are the future while contributing presently. Sophomore Meg McCourt (Rochester, NY/Brighton) has started all 16 games in goal. The Tufts defense, which has allowed less than 10 shots per game, has helped McCourt post a 0.69 goals against average in 1,430 minutes of play. The Jumbos and McCourt earned seven shutouts this season, including four in the last five games. "This team, more than any other team I've seen here, is very athletic, fast and really skillful," Whiting said. "From the freshmen right up through the seniors we're extremely deep. I feel like they are all confident in one another. Really, they all feel like no matter who is on the field, that person, or that group of people, is going to get the job done."